On the picture of Spaso-Preobrazhenski Cathedral of the Solovki Monastery, the sixth dome appeared in the rose-coloured shine. The picture was taken by a pilgrim on her mobile phone. The Orthodoxy in the Northern Land website reports Friday that it is symbolic that the monastery's history began with the vision to St. Zosima of a church in celestial shine. The first wooden church of Transfiguration was built at the place of this vision. Located on the Solovki Archipelago in the White Sea, the Solovki (Solovetski) monastery was founded between 1429 and 1436 by the hermits Savaty and German, followed by the monk and future abbot Zosima. By the early sixteenth century, Savaty and Zosima had become the patron saints of the White Sea region. Solovki, also a garrison, was one of Russia's most important cloisters with extensive territories, earning income from trade, salt, fishing, and rents. 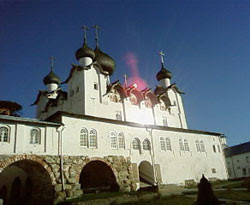 Metropolitan Phillip II of Moscow contributed significantly to Solovki's architectural development while serving as abbot (1546 - 1566). Its monastic rule, formulated in the late sixteenth or early seventeenth century, became a template for later communities. Tsar Alexei Mikhailovich's troops besieged Solovki from 1668 to 1676 in a conflict traditionally linked to Old Belief. Solovki's leaders and a large part of the brotherhood first accepted, then rejected, Patriarch Nikon's liturgical reforms. However, rebellion against central authority combined religious concerns with anti-Moscow sentiment fostered by political exiles imprisoned at Solovki. After their defeat, many monks left, ultimately to swell the number of trans-Volga elders - hermits who served as spiritual fathers to disaffected Orthodox communities. 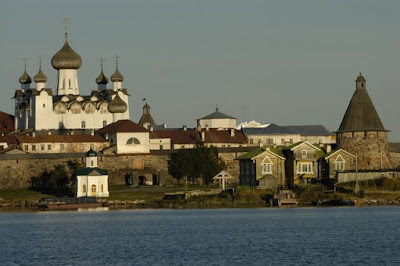 Solovki remained an active monastery and popular pilgrimage site until the October Revolution, after which the Soviet government transformed it into a military training camp. It became a labor camp in the 1920s and 1930s for political prisoners. Abandoned soon afterward, Solovki was reopened as a museum in the 1970s, then closed again until the end of Soviet rule, when it was reopened to the public. Michels, Georg. (1992). "The Solovki Uprising: Religion and Revolt in Northern Russia." Russian Review 51:1 - 15. Spock, Jennifer B. (1999). 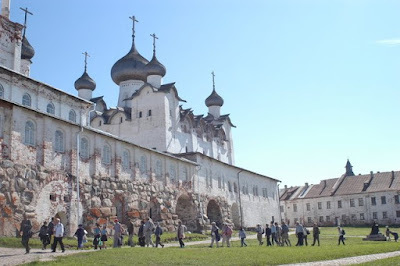 The Solovki Monastery, 1460 - 1645: Piety and Patronage in the Early Modern Russian North. Ph.D. diss. Yale University.